Research into disease mechanisms is an important basis for the development of novel, targeted therapies. The path from disease-oriented basic research towards clinical application in patients (= translational medicine) is however long and cost-intensive. Suitable animal models which allow predictions on the efficacy and safety of novel therapies are inevitable in this process. Rodent models are most widely used, but are often limited in the resemblance of human disease mechanisms and phenotypes. Therefore effects of new treatments in humans are sometimes difficult to predict on the basis of findings in rodents. Thus large animal models which mimic anatomical and physiological parameters of humans more closely are additionally needed. For a number of reasons the pig is a relevant translational animal model. Due to the establishment of efficient and precise techniques for genetic modification of pigs, it is possible to generate tailored pig models which mimic human disease mechanisms on a molecular and functional level. Diabetes mellitus (DM) has emerged into a steadily increasing health problem and the predicted future dimension of the global DM epidemic is alarming. Thus concerted research efforts are imperative to gain insight into disease mechanisms and to develop preventive and therapeutic strategies. Genetically engineered pig models may help to bridge the gap between basic research and clinical studies in (pre)diabetic patients (reviewed in Renner et al., Theriogenology 86, 406-21, 2016). The incretin hormones glucose-dependent insulinotropic polypeptide (GIP) and glucagon-like peptide-1 (GLP1) are secreted by enteroendocrine cells upon nutrient ingestion and stimulate insulin secretion. In type 2 diabetic patients the insulinotropic action of GIP is markedly reduced. To mimic this disturbance in a large animal model, we generated transgenic pigs expressing a dominant-negative GIP receptor (GIPRdn) under the control of rat Ins2 promoter sequences in the pancreatic islets (reviewed in Renner et al., J Pathol 238, 345-58, 2016). GIPRdn transgenic pigs exhibit an impaired incretin effect due to a blunted insulinotropic action of GIP, a progressive deterioration of glucose control due to delayed and – at later stages – quantitatively reduced insulin secretion, and an impairment of physiological age-related expansion of beta-cell volume (Renner et al., Diabetes 59, 1228-38, 2010). GIPRdn transgenic pigs thus provide a unique opportunity to screen for biomarker candidates during the pre-diabetic period (Renner et al., Diabetes 61, 2166-75, 2012) and to test therapeutic strategies targeting the GLP1 receptor (Streckel et al., J Transl Med 13, 73, 2015). 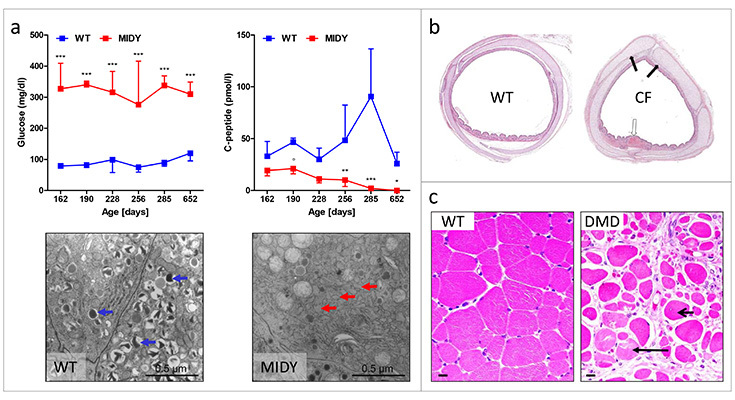 Missense mutations in the INS gene have been identified as common cause of insulin-deficient, permanent neonatal diabetes mellitus in humans, also referred to as mutant INS gene-induced diabetes of youth (MIDY). We produced a transgenic MIDY pig line expressing INSC94Y under the control of the porcine INS promoter. MIDY pigs show early-onset clinical diabetes mellitus, markedly reduced body weight gain and beta-cell volume associated with a marked reduction of insulin secretory granules and severe dilation of the endoplasmic reticulum in the beta-cells (Renner et al., Diabetes 62, 1505-11, 2013). MIDY pigs can be used for insulin treatment studies or for testing the efficacy of gene or cell therapies as well as islet transplantation. Secondary lesions of diabetes mellitus are another interesting area of research. We thus established the Munich MIDY pig biobank (highlighted in Abbott, Nature 519, 397-8, 2015) as a unique resource for studying systemic consequences of insulin insufficiency and chronic hyperglycemia (Blutke et al., Mol Metab, in press). Future studies aim at dissecting organ crosstalk in diabetes in a multi-organ, multi-omics approach. A second focus is on the generation, characterization and implementation of pig models for rare monogenic diseases. This is particularly important, if existing rodent models do not mimic the human disease mechanisms and/or phenotypes. We thus generates pig models for cystic fibrosis (Klymiuk et al., J Mol Med 90: 597-608, 2012), Duchenne muscular dystrophy (Klymiuk et al., Hum Mol Genet 22: 4368-82, 2013) and growth hormone receptor deficiency (Laron syndrome). Detailed studies of these models focus on disease mechanisms (e.g. Fröhlich et al., Sci Rep 6: 33362, 2016) and testing of targeted therapies.